Expanding on a Streetscape Plan developed by the Govanstowne Business Association in 1994, the Committee completed a comprehensive Master Streetscape Plan in October 2004. The City began implementing Corridor improvements in sections, beginning with the section between Northern Parkway and Tunbridge Road in 2005. The final phase is currently being addressed as TR10-319 from Glenwood Avenue to 43rd Street. The last portion of this project that involves the intersection at Coldspring Lane was completed in Spring 2015. The Committee has developed an inventory of trees on the York Road Corridor. This inventory allows for easy identification of trees that are in need of maintenance or need to be replaced. 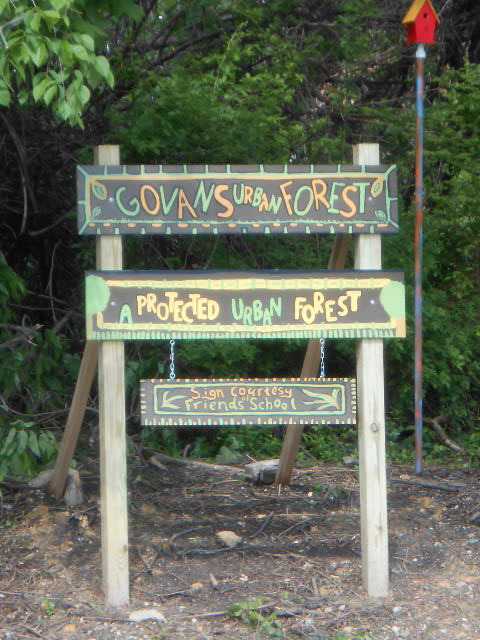 The Govans Urban Forest (or GUF for short) is a small city-protected forest patch located between CVS and Govans Boundary Church in the 5200 block of York Road. In Fall 2012, the York Road Partnership began work in the forest with additional help and resources from Loyola University and the Friend’s School. Illegal dumping has been removed as well as a large portion of invasive ivy and vines. We have planted native species of trees and bushes from Herring Run Nursery, secured through grants and donations. We are hoping this space will become an area of learning for local schools and a place of meditation and relaxation for local churches and residents. This is an on-going project for which ‘volunteer days’ are scheduled periodically. Check the calendar to participate in upcoming volunteer events. 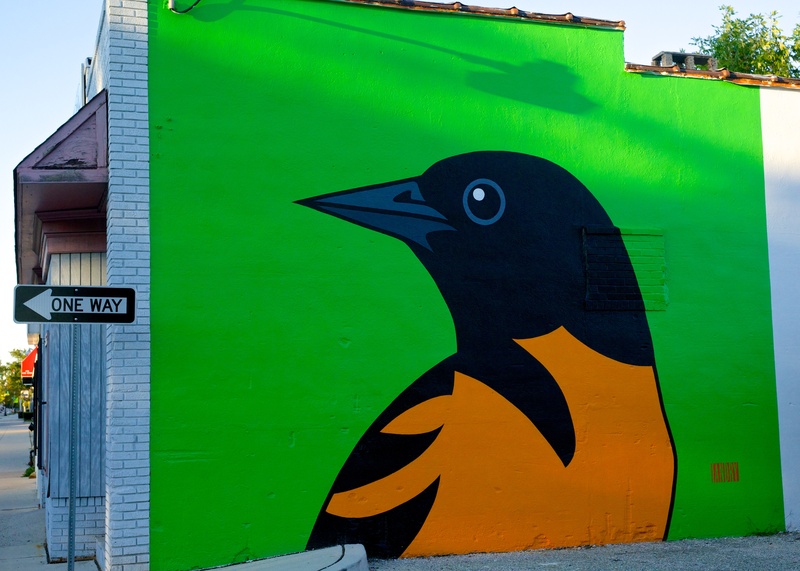 As part of Baltimore’s 1% for Public Art Program, the Baltimore Office of Promotion & the Arts hired community artist Iandry Randriamandroso to design and paint 5 original murals of native Baltimore birds. Those murals can now be found along York Road between 43rd street and Glenwood Avenue. Community stakeholders including the York Road Partnership and the Govanstowne Business Association chose the local birds as the subjects of the murals due to their universality, inclusiveness, and connection to the local environment. Some words from the artist: “In ever changing urban landscapes, they [the birds] represent adaptation, resilience, and the continuation of life. When changes occur in a neighborhood, it will change the dynamic make- up of the population- new inhabitants come; some leave; some stay and adapt with the new changes. Eventually, they represent us and our neighbors”. 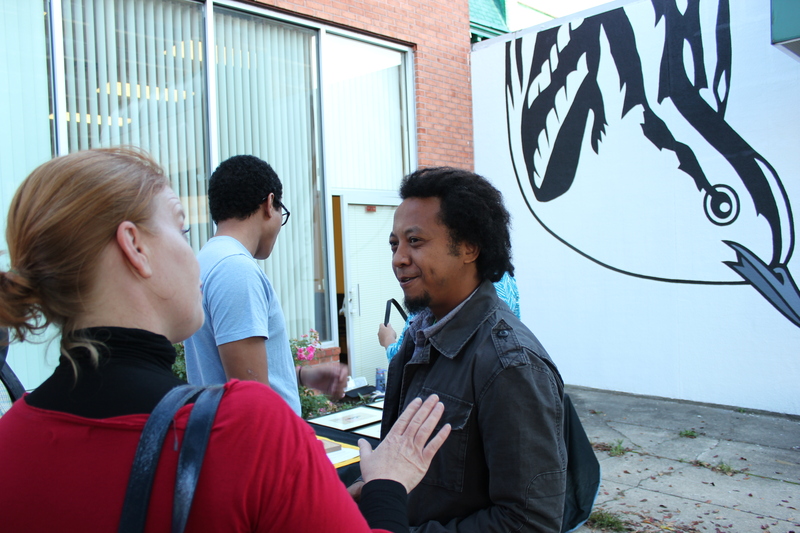 On October 17, 2014 the murals were officially introduced to the community with an afternoon of mural tours, bird-related crafts, art for sale, great weather, and an opportunity to meet the artist. To spot the birds, just follow their bright plumage along the corridor: Oriole at 4333 York Road on Riley’s Beauty; Cedar Waxwing at 4811 York Road on Gomez Tires; Woodpecker at 5017 York Road on Afrik Salon; Blue Jay at 5219 York Road on Academy Cleaners; Warbler at 5225 York Road on Northern Community Action Center.